Just as advertised, it pours royally gold with a firm collar of foam and some yeast cloudiness. The fruity aroma of grapes, honey, and spices is fit for a king. The sweet flavor of honey mead and fruity wine up front overshadows light malt and saffron. The finish is dry and smooth. This beer smells delicious! Throughout this process, I will be learning a little bit about each beer before we drink them. That way I know what to expect going in. For instance, this beer was molded after what was thought to have been in a glass over 2,700 years ago. Imagine… drinking beer this good that long ago! Or being the one that found that tomb. Crazy to think stuff like that still remains. Anyway, back to the beer. The nose is filled with fruit. It smells smooth (smell it, you will see what I mean) and quickly leaves your nostrils. Makes me want to take a sip. So, why not… bottoms up. This does NOT taste like beer. Holy cow, what is that on the front of my tongue? Who cares, it’s delicious. The beer is cloudy in the glass, and you expect it to be somewhat carbonated but it’s not… at all. This beer drinks extremely smooth and has a ton of flavor on the palate. Then to the aftertaste, which at first is stellar. But then it quickly leaves making me want another sip! If I can say anything about this beer… it’s a BIG beer. With an ABV of 9% (a 9% which you would never know just from smelling or sipping this beer), you have to be extremely careful. This is the biggest beer we have tried, and while we are sharing a bottle this evening, I would be scared what a six pack would do to us! The beer is good. The beer is very good. I can’t quite give it a perfect rating here… but it’s close. There needs to be more on the aftertaste for me to go for a perfect score. Regardless, it’s delicious and I can’t wait to try this brew again. Well done Dogfish… well done. I’ve actually had the Midas Touch before. I believe that it’s the first one of the beers that we’ve tried for this so far that I have actually had. I liked it the first time, and I still like it now. This beer pours out as a lemony yellow color, but tastes nothing like lemon. 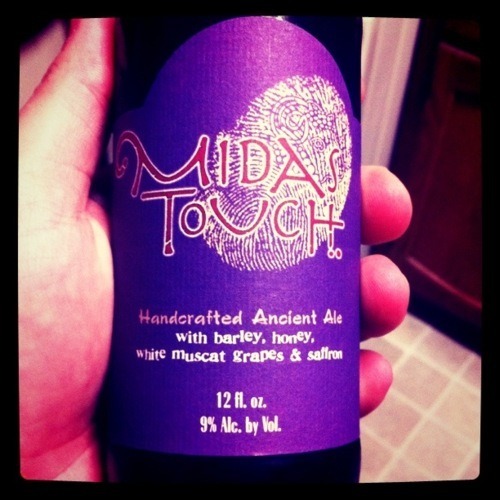 I like the concept of this beer – Midas Touch implies a taste of gold. The label describes it as “handcrafted with barley, honey, white muscat grapes, and saffron”. All of those tastes in one beer? Definitely sounds like something worth tasting. This beer smells great being poured out of the bottle, and tastes just as good, in my opinion. It’s got a carbonated look and taste, and just a very interesting, almost indescribable flavor. I can’t really distinguish all of the flavors described on the label, but it tastes a bit fruity without having the normal disappointment of most so-called fruity beers. The flavors actually blend pretty well together. This beer tastes good and has a high alcohol content that you can feel. It’s a good taste and feel, something I’d definitely buy again.